Earlier this year, Jimmy Kimmel’s camera crew took to the streets of LA to ask people who followed a gluten-free diet if they actually knew what gluten was. Some of the responses included “it’s in products like bread, pasta, and rice” to “it’s like a grain, right?” and even “this is pretty sad, but I don’t know.” I spent my summer researching celiac disease with a registered dietitian in Boston; she specializes in celiac disease and has it herself. The more I worked with her the more I wondered to myself: how many people actually know what gluten is and how it affects someone with celiac disease? Gluten is a protein found in wheat, rye, and barley. Each previously mentioned grain has a specific storage protein: gliadin in wheat, hordein in barley, and secalin in rye. If a person with celiac disease eats any food products containing wheat, barley, or rye, the storage proteins within the grains will trigger their body to begin attacking the villi lining the small intestine. This autoimmune response classifies that celiac disease as an autoimmune disease, not an allergy. Gluten is actually a toxin to people with celiac disease. Interestingly, other autoimmune diseases (lupus, type 1 diabetes, thyroid disease, etc.) are often associated with celiac disease. It seems that there is a lot of misconception about gluten-free diets. The gluten-free diet is not inherently healthy, which may surprise most people, especially those who follow it to lose weight or become healthier. 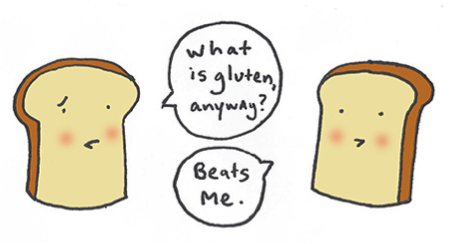 Currently, research has shown little to no benefit of following a gluten-free diet if you do not have celiac disease. Most of the products out there that are advertised as gluten-free are processed and low in nutrient density. The registered dietitian I worked with found that some of her patients gained a significant amount of weight when first starting their gluten-free diet. However, following a gluten-free diet complete with fruits, vegetables, lean proteins, and gluten-free grains (quinoa, teff, millet, rice, sorghum, amaranth, etc.) would provide a celiac patient with all the necessary nutrients to live a healthy lifestyle.